PTCL, once again, upgraded all regular 1-Mbps customers to 2-Mbps DSL Speed. All regular 1-Mbps customers will now get 2-Mbps internet speed at price of 1-Mbps. 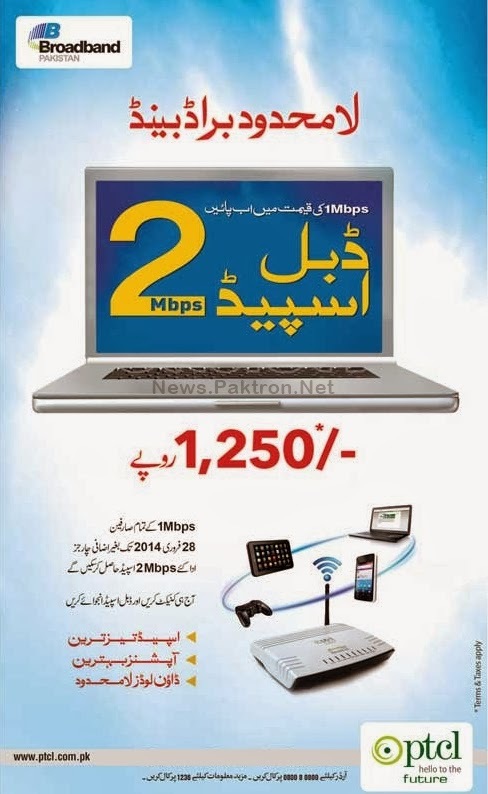 2Mbps Broadband promotion charges: Rs.1,250 per month. All Regular 1Mbps customers are being upgraded to 2Mbps. Valid Up to 28th February 2014. Rs 1,549 will be charged for 2Mbps after promotion period. No extra charges will be charged to customer before 28th February 2014. All customer who do not wish to continue with 2Mbps will have to Opt out by calling 1236 and reverting back to 1Mbps, before 28 Feb 2014.